A Scandinavian bedroom reflects the love the inhabitants of Northern Europe have for nature, natural materials, cozy textiles and sunlight. 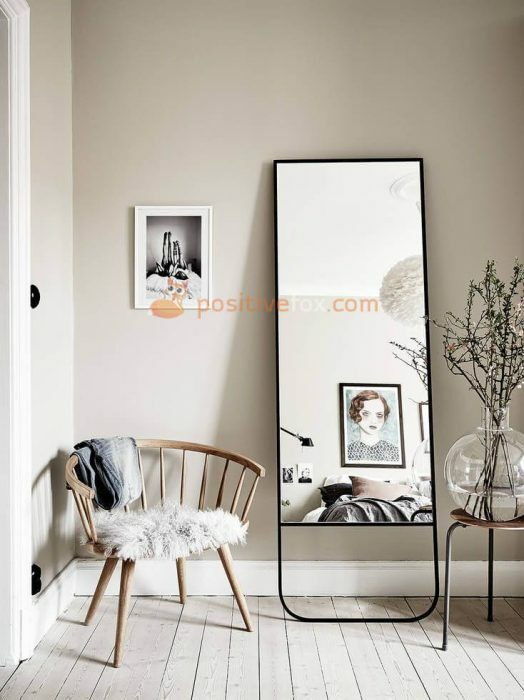 A simple, elegant and beautiful Scandinavian Interior is filled with exceptional charm which makes it so popular around the world. In a classic Scandinavian interior, functionality is valued above aesthetics, and the color palette is muted. 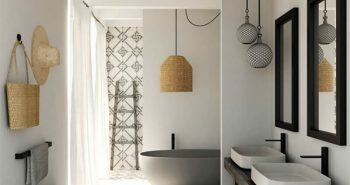 Minimalism is an integral feature of this style, which makes it ideally suited for modern homes whose owners appreciate the lack of clutter and unnecessary items in the space. 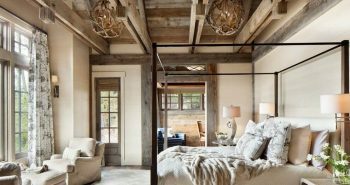 To design a Scandinavian bedroom, you must follow certain rules, paying attention to particular details. You often see an open dressing room in Scandinavian bedrooms. This is mostly because large cupboards take up a lot of living space, which is considered taboo in Nordic interior design. 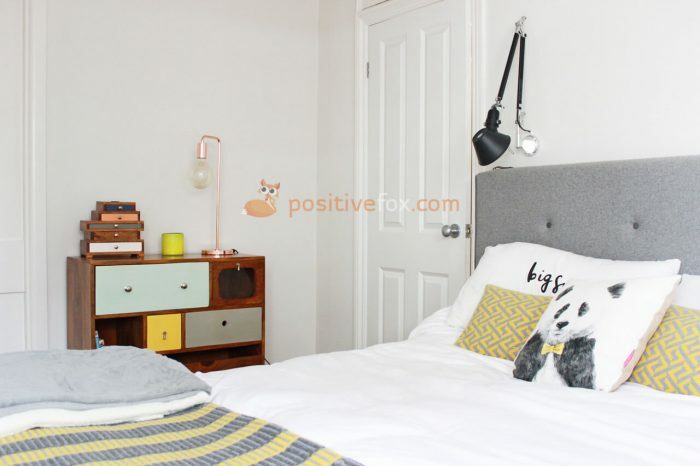 In a Scandinavian style bedroom, there should be plenty of natural light. 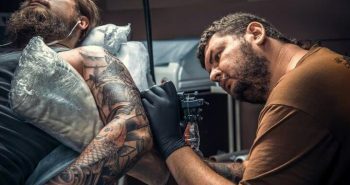 Artificial lighting should be kept to a minimum. 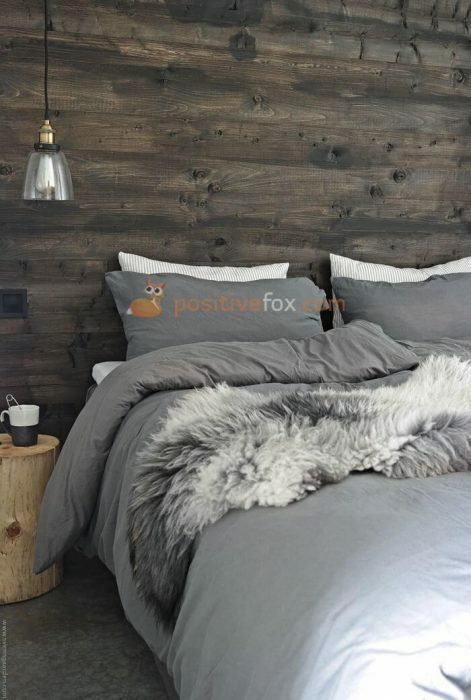 Wood, glass, stone, fur, cotton and leather are perfect materials to bring to the bedroom design. The most notable feature of this interior is a high, soft bed. An important characteristic of this style is the presence of large mirrors in each room, and the bedroom is no exception. 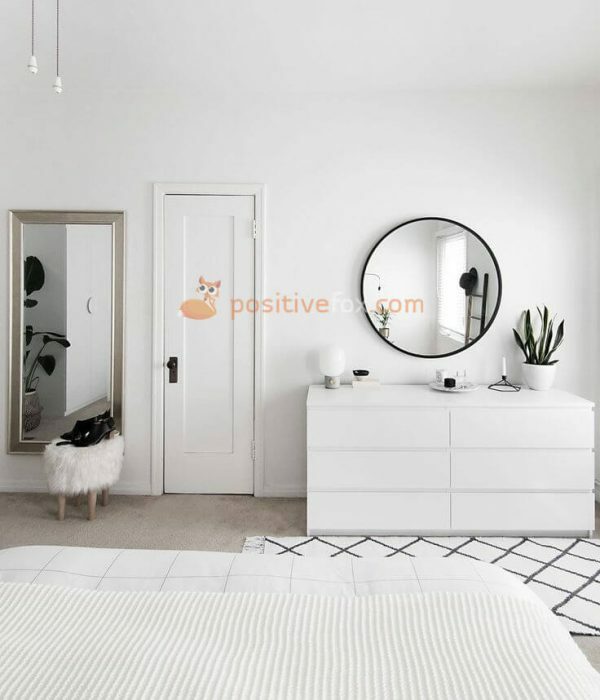 White is the preferred color for walls, floors and ceilings in a Scandinavian bedroom. 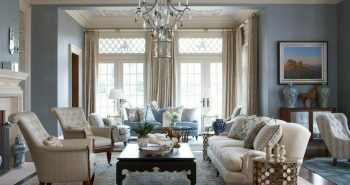 To avoid making the room resemble a nursing home, incorporate various textures (wood textures on the floor, stucco, an abundance of textiles, fur) and contrasting colors (bright pillows, bedspreads, rugs, curtains, fresh flowers, wooden furniture) into the interior. If the “white on white” arrangement seems a bit too plain, add a light shaded parquet or laminate floor. 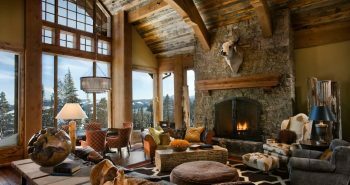 Your interior will have a warm, cosy and eco-friendly look. Do not underestimate the presence of black in a Scandinavian bedroom. 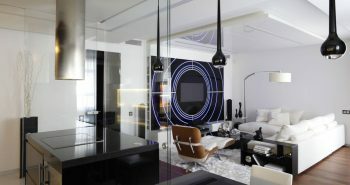 Black helps identify and highlight the architectural features of your room and provides an ideal visual balance. 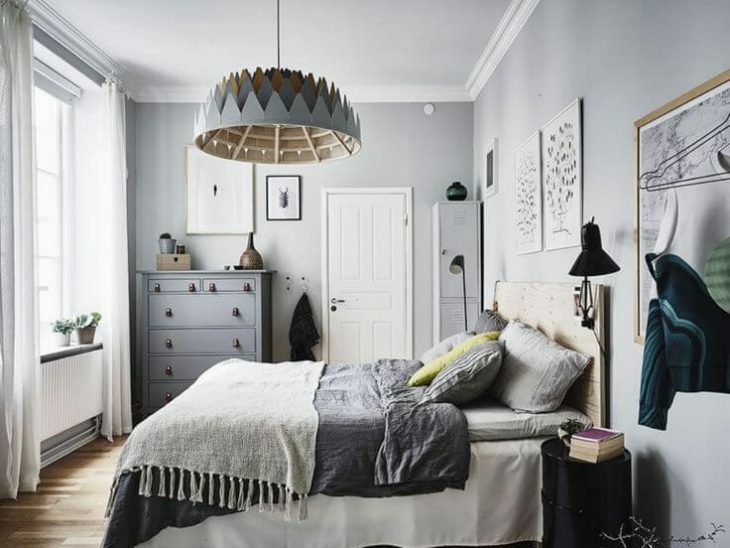 Shades of grey reinforce a seemingly monochromatic appearance and give a Scandinavian bedroom a refined aura. 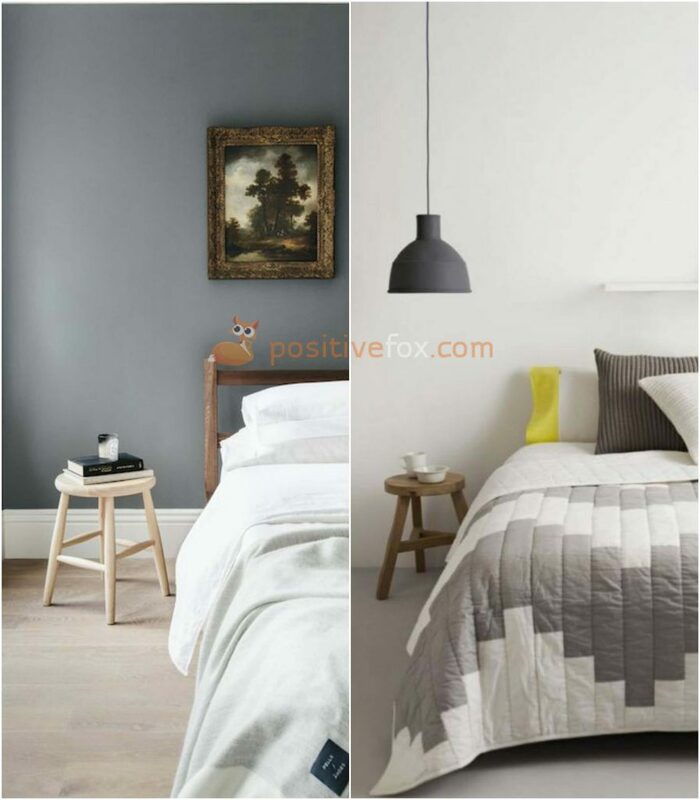 White or beige plaster, light blue and grey paint are perfect wall colors and finishes in a Scandinavian bedroom interior. 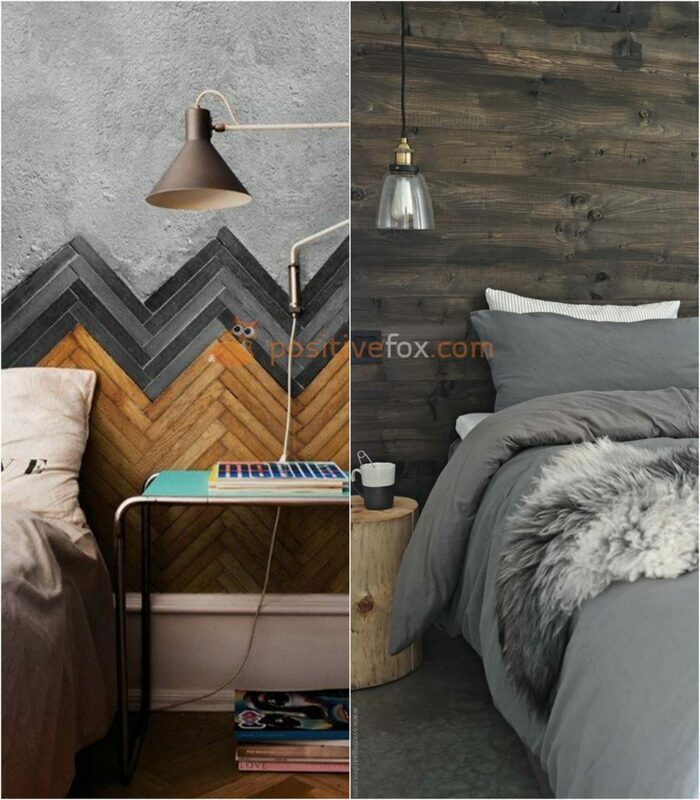 Scandinavian bedroom walls can be covered with wooden panels or horizontal boards, which will add comfort to the room. 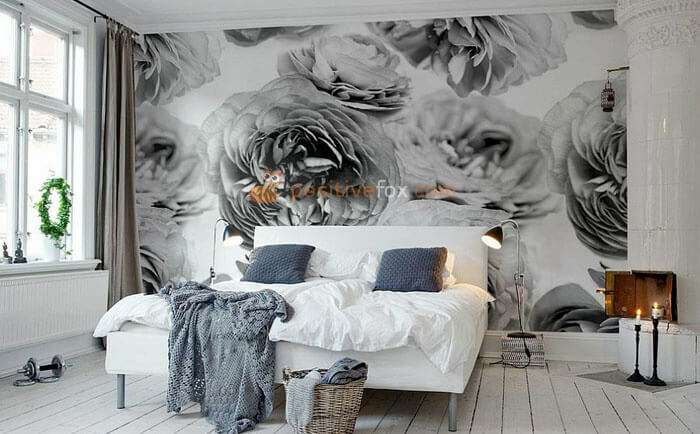 To liven up the snow-white interior of a Scandinavian bedroom, you can cover one of the walls with beautiful floral-patterned wallpaper. 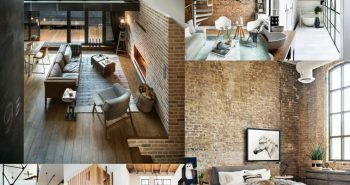 Classic red brick perfectly complements a minimalist interior. 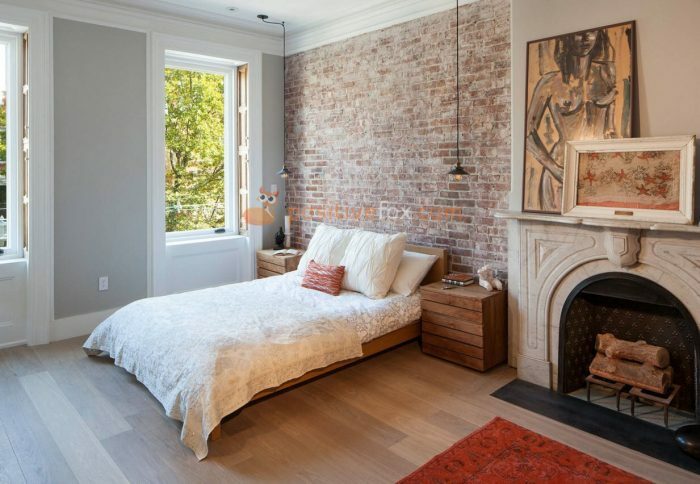 Contrasting a brick wall (or even a small part of it) will revive the bedroom and give it a special charm that is intrinsic in loft style design. The main feature of a Scandinavian bedroom is the amount of sunlight and air. Scandinavian design prefers windows without curtains which illuminate and expand the space. Huge windows in snow-white frames are sometimes decorated with curtains. However, they should be light and translucent, so as not to interfere with the penetration of light in the room. Scandinavian design also makes use of Roman blinds, which remain in an open position most of the time. 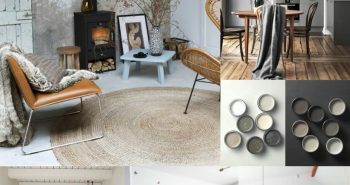 The floors in Scandinavian design are often light-colored. The floor should not attract too much attention as its main function is to serve as a background for the furniture. Parquet or laminate flooring are the perfect solutions. Light, natural colored wood are also popular in apartments in northern European countries. Beige, peach and other light-colored carpets blend in well with a light-colored floor. 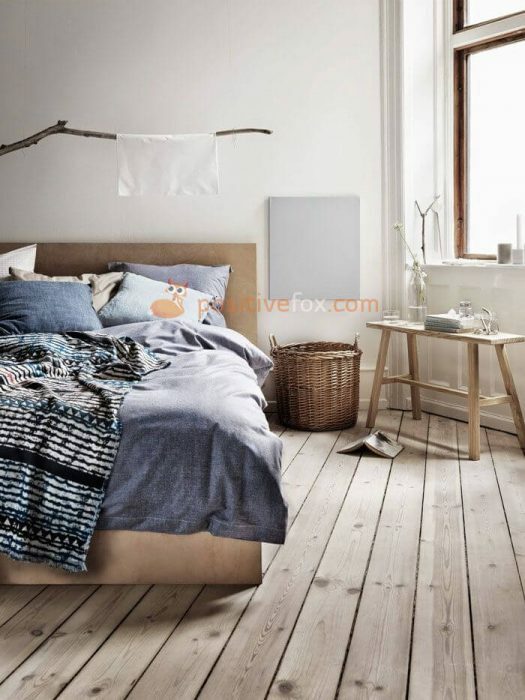 Scandinavian style bedroom design is characterized by clean and simple lines that create coziness. Elegant and multifunctional furniture is most often made of wood. The bed and the cupboards can be painted white. The bed takes center stage in a Scandinavian bedroom. The wooden bed shouldn’t be particularly wide or high. It should be placed head to the wall and perpendicular to the window. Both sides of the bed should have bedside tables. Coffee tables, stools and ordinary chairs with backrests can be used in place of typical bedside lockers. Shelves can be hung on the wall, often above the bed. 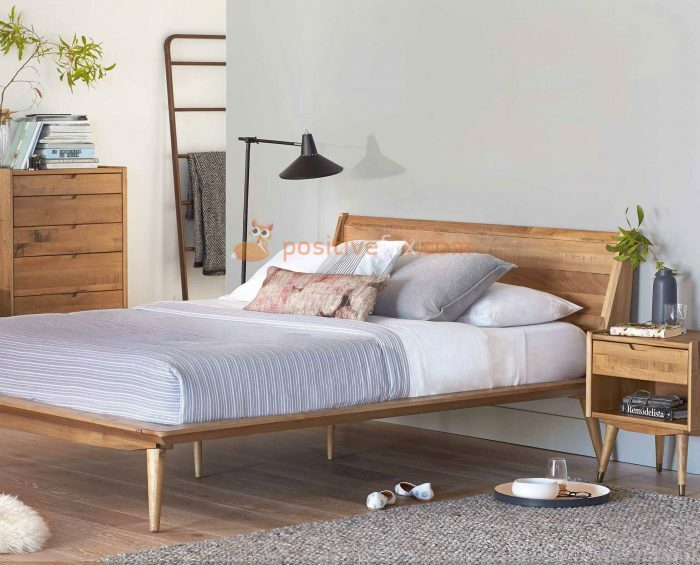 There are no unnecessary items in a Scandinavian bedroom – each element is carefully selected to become an integral part of the interior. 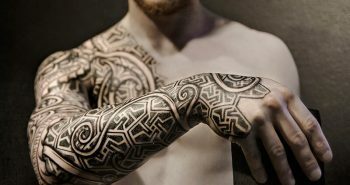 Modern posters, paintings and photographs should be incorporated in the design. Combine frames and images of different sizes to create collages and unusual compositions that will make a fine addition to the interior. 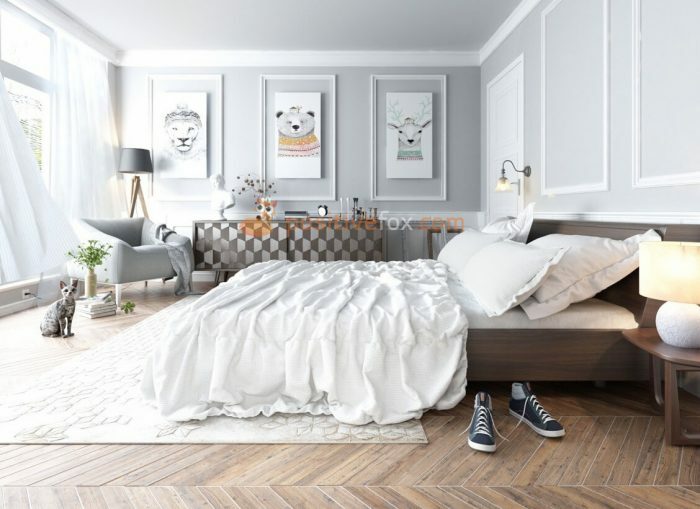 Scandinavian style bedrooms are decorated with wood, bright colors and black and white accents. All three of these elements can be combined. Wooden elements allow you close the gap between design, nature and local culture, making the interior more comfortable. Fur skins and blankets, give comfort and “warmth” to the bedroom. Potted plants, fresh flowers, ceramic figurines, floor lamps and lampshades give the interior a special atmosphere.